Uncle Keith and Aunt Eileen. Growing up my Grandparents on my Mom's side lived too far away to be an active part of our lives. It took over 24 hours to drive to their place so you can imagine that it was only every few years we'd have a chance to meet up. Even then for so long they lived such a different life style then us that it was foreign to just be around them. In fact it wasn't until I was a teenager that I felt like I had actually connected with them. While my Mom's parent's weren't a big part of my life I did have some amazing adopted Grandparents. Aunt Eileen and Uncle Keith were always involved in my life. They are my Mom's aunt and Uncle. Even though they lived in Idaho they rarely missed a birthday or baptism. They met every single one of my boyfriends, knew my grades, what I was struggling with and encouraged me to succeed. They supported me at grandparents day at school all through Elementary, all my recitals, my graduation and my wedding. On top of all the great memories, I always knew they loved me and I could go to them. Aunt Eileen's latest projects, her soft hugs, and her way cute giggle. Uncle Keith's radio terms, his Ernest and Lampoon quotes, his subtle humor, him proud that I married a tall red-head and him leaving his pocket coins for us every time he visited. I think I still have most of them. The summer of 2004 I brought Ethan up to their house for a visit and was comforted that everything was the exact same as it always has been. The house, their decorations, their old movie collection and even their homemade jams. It was wonderful. Unfortunately, my kids will ever get those memories with them. Last night Uncle Keith passed away. I know he lived a long wonderful life but I still feel upset over it. Like the axis of the universe has tilted and is askew somehow. He's been sick for years with everything you can imagine but I guess I always felt like he would always be there. I haven't seen them in 2 years and I was already missing them before this but now I just feel like a fool for not finding a way to see them in so long. I know it's too late but, I love you Uncle Keith. Just found these in that treasure box I mentioned last week... Made for my Mom 20+ years ago.... I still think all these great things about her... and more. Let's add to the list that she is my emotional anchor. 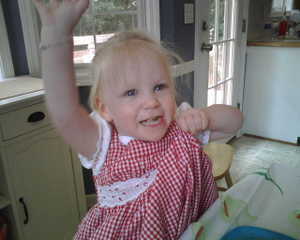 She get's me through everything from Autism to Aging. We talk almost everyday and she is my best friend. She has managed to build and maintain an amazing relationship with my kids despite living so far from them their entire lives. I couldn't live without her. She's the best. Thanks for coming out this past week Mom. I needed that. I love you. This was my blanket when I was a baby. I loved this thing and slept with it until I was at least 10 years old. I loved the eyelet ruffle edges and even now you can see just how thread-bare they are. I loved the red plaid and apparently so did my Mom. She made these quilts for all of us kids and a lot of my cousins. Everyone got a different plaid color and mine was definitely the best in red. The funny thing is that there are certain things about a person that never change. 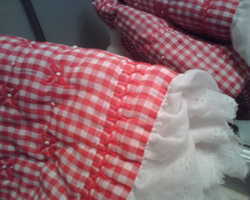 Like the fact that Mom and I still love red plaid fabric and little white eyelet trim. She bought this little dress for Lorali a few weeks ago. As soon as I saw it I fell in love and it only took a minute to realize that this is the dress version of my blanket. No wonder it's now my new favorite outfit for Lorali. She wears it every chance I can get it on her, I even find myself washing it mid-week so she can wear it again. Somethings never change and I love being reminded of things I love, even if it's as simple as red plaid and eyelet fabric. I love you, Mom. Thanks!